After clicking on a image, it will increase a bit, as shown on the image attached here. Next step, click on the icon at the bottom (indicated by the red arrow) and it will enlarge a lot. In my internet connection it takes about 20 seconds to fully appear on the screen. Then, on the left side of the screen you can use Tools, to zoom in or out, as you wish. Does anyone know if the records from Parafia w Suchej Beskidzkiej are online? I am searching for Julien Pajak born December 17 1903. The forum has a Russian records translation, Polish records translation and Latin records translation topics. Records afer June 1868 are in russian (sometimes in Latin) for the territories that were under Russian rule. I've noticed that in my area of research, which is mainly around Slupca County in Wiekopolskie, there are sets of records missing. For example, in Mlodojewo parish, the FHL has microfilm that spans between 1773-1904 for births, but the film is missing the years 1796-1807, 1813-1817, and 1819. When I checked on szukajwarchiwach.pl, they are missing the same years in that specific example (although online, the birth records also don't begin until 1808). But I'm finding multiple examples of this in different parishes. 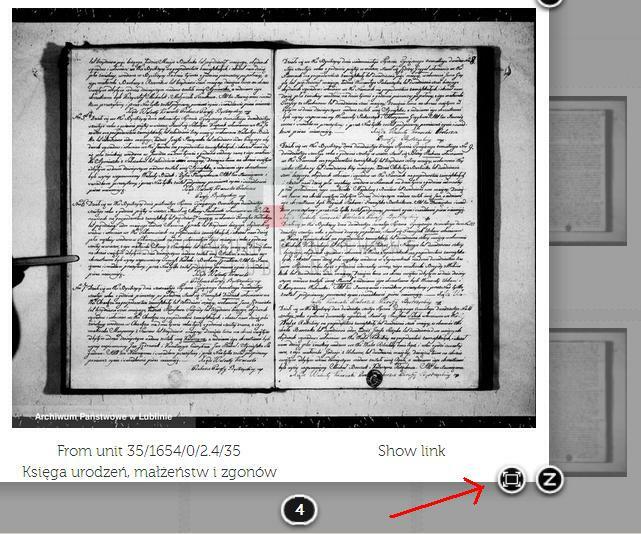 I feel like there's an obvious website I'm missing to determine archival holdings, but I did a search at baza.archiwa.gov.pl/sezam/sezam.php? and all that did was bring me back to the szukajwarchiwach.pl listing for Mlodojewo. Would I have to contact the appropriate branch of the state archives directly to find out whether the records exist for the missing years, or does anyone else know of another way to find this out? I'd be happy to learn the missing record years won't be available online, but that they DO still exist and could still somehow be requested. I am genuinely curious to know why selected sets of records get skipped over during the scanning process. If it's due to poor condition, I can't help but think that scanning can only help by save what's left before it's too late, but what do I know? I've also found that records for the years you mentioned for the parish of Mlodojewo are also not to be found in the state archives for other parishes I've researched in the same general area of Wielkopolskie and Kujawsko-Pomorskie and have concluded that civil transcripts for those years probably do not exist. The reason I say this has more to do with the political history of that area than not looking in the proper place where the records may be held. The years 1796-1807 correspond to the period between the 3rd Partition and the formation of the Duchy of Warsaw. During those years the area you are interested in was under Prussian control and the keeping of civil transcripts was still rather fluid at that point. The reason records appear for the years 1808-1812 is that the area was part of the Duchy of Warsaw during that period and the constitution Napoleon devised for the Duchy required civil transcripts to be kept in Polish in the long paragraph format beginning in 1808. Then came Napoleon's defeat in the expedition to Moscow followed by his defeat and exile after Waterloo which also put an end to the Duchy of Warsaw. After the Congress of Vienna in 1815 the boundaries of Europe were once again redrawn and the area then passed to Russian control as part of the so called Congress Kingdom of Poland and once again the keeping of civil transcripts was in a state of flux. When things settled down civil transcripts were kept in Polish in the long paragraph format in the style which remained rather constant until the switch to Russian in 1868. (The style of the Polish records from the period of the Duchy of Warsaw into the early 1820s is different both in form and in the linguistic style from that of later records.) So basically it seems that during the times of political upheaval the civil authorities had bigger fish to fry than concerns about the keeping of civil vital records. Also, if you look at where the records are housed and where they were filmed by LDS volunteers you'll notice that they are found in both state archives and the archives of the diocese of Wloclawek. It would seem that if records for the missing years are not housed in either the state archives or the archives of the diocese to which the parish belonged then they are probably not housed in either a civil or an ecclesiastical archive. Perhaps this means that a copy of the religious records may be kept in the local parish and a copy was just never sent to the archives of the diocese. As a kind of side note....Permission given to the LDS volunteers to film records in the archives of a diocese was not given by every diocese in Poland. In fact, it seems that more archives refused permission than granted it so I've considered myself fortunate that Wloclawek did grant permission as films of those records have been very helpful in my personal research. Wishing you the best of luck in locating the missing records. Dave I apologize for my delayed reply - thank you SO much for the information! I knew about the partitions, but it never occurred to me to check the dates against the timeframe of the record gaps! Being familiar with how vital record-keeping went over poorly (on average) in the US, I just never imagined it would be an issue in the Polish parishes - how silly of me. There are some important pieces of information I'm missing which I was hoping those records could fill in. It looks like I need to educate myself more on the history of the area, as well as what other options there are (if any) of other types of records to seek out. Thank you for taking the time to share this information, I truly appreciate it! Dear Forum mates. Could you recommend someone from Kalisz that could go to Archive Kalisz and get a couple of documents for me? I don't know if there's something wrong with my e-mail address, but I've tried to contact Archive Kalisz by email many times and I've never received an answer back. AP Torun (Wloclawek ) + AP Bydgoscz (Inowroclaw) have finally started releasing their collection online. More 1,8 million scanned images promised till the end of June. Indexing volunteers are welcome. Posted: Fri Oct 16, 2015 2:55 pm	Post subject: 1.2 million scans added to http://www.szukajwarchiwach.pl/ ! Is there a way to find out what was added?